Others highlighted the notoriety of the revival’s geographical birthplace. F. W. Pitt, a prominent London pastor, dismissed the stirring as a peculiarly American phenomenon, “the land of wonder-meetings and freak religions.” Another writer affirmed what many suspected: Los Angeles harbored more fanatics than any city in the United States. Families dissolved, churches split, denominations broke apart. The most conspicuous divisions took place within the Church of God in Christ, the Fire-Baptized Holiness Church, the Holiness Church of North Carolina, and the Christian and Missionary Alliance, all of which ruptured or suffered severe defections between 1907 and 1910. Many fellowships witnessed steady and painful attrition. In the face of this real-life nightmare, evangelical leaders mounted a multi-pronged counterattack, specifying Pentecostals’ defects one by one. Accumulating evidence from reliable eyewitnesses contained “statements of facts too shocking to print.” Other leaders felt no compunctions about exposing Pentecostals’ so-called depravities. Spiritual pride seemed to spawn other worms, especially looseness with the truth. Critics suspected Pentecostals exaggerated the number of people who attended their meetings, misstated the results of their services, and told outright falsehoods about miraculously speaking foreign languages. Above all, they perjured themselves when they recounted the healings that took place in their meetings. In a work symptomatically called Faith Healing Tragedies, F. W. Pitt claimed that he had attended many healing meetings and, yes, he had seen a few cures but only of slight nervous conditions. Worse yet, according to the critics, Pentecostal religion actually endangered the physical body. Enthusiasts got hurt when they fell into trances, bumping into objects or crashing to the floor. Critics claimed the records bristled with stories of devotees sprawling to the ground after discarding their crutches, fighting back tears after tossing away their eyeglasses, or even dying after stopping desperately needed medical treatments. Famed Bible teacher Harry A. Ironside knew one adolescent woman who had lost all of her hair because of the “unnatural excitement” of Holy Ghost meetings. On several occasions, some said, the determination to fast until Jesus returned had led to near or actual death by starvation. China Inland Mission personnel worried that meetings of the local Pentecostal Missionary Union produced “consequences of a dangerous character,” including “strain upon the brain” and, occasionally, “insanity.” The Nazarene Herald of Holiness alleged—without a scrap of proof, it should be said—that Pentecostal teaching actually stirred converts to go out and murder their enemies. The situation became especially volatile when children were involved. In Alliance, Ohio, Quaker Pentecostal Levi Lupton made the mistake of inviting a boy to his camp meeting. The boy’s mother sprang into action. She hired local toughs, who invaded the meeting, squirted Lupton and several worshippers with sulfuric acid, then retrieved her child. If the wrenching of families aroused the most intense passions, the disruption of local churches ran a close second. “No community is safe from this most dangerous heresy,” thundered one editor. Pentecostals fought back. And their response was often every bit as vigorous, innovative, and unfair as the attacks of their critics. The most common retort was, in effect, “Look at our record, see what we have done.” To Pentecostals, their record of accomplishment was nothing less than supernatural. Souls saved, bodies healed, addictions eradicated, debts paid off, marriages restored, even adolescent children tamed and brought back into the loving folds of family and church. "The Devil tempted me to believe that we were on the wrong track, that it was some sort of made up hypnotism, or altogether from the Devil himself.” But when Franklin opened his eyes and observed the dramatically changed lives of those who had undergone the baptism experience, he knew beyond doubt that the movement could only be of God. 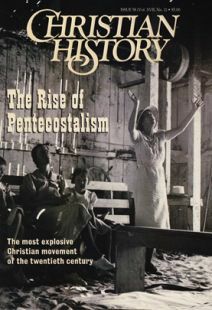 Of all the indictments against them, Pentecostals found the charge of schism the most incredible. With a regularity that bordered upon litany, they pointed out that the revival had brought together Friends, Brethren, Methodists, Salvationists, Baptists, Congregationalists, even Roman Catholics. In the face of so much good accomplished, how could anyone court God’s wrath by mocking the Pentecostal revival? True believers among the Pentecostals offered many answers. Many of the detractors, they asserted, were backsliders to begin with. Some were born fighters who would rather foment trouble than save souls. Other critics had already proved themselves intractably obstinate, very much like the foolish virgins in the Scripture. Some were simply and inexplicably perverse, for no good reason. And so it went, year in, year out. Occasionally gentler spirits like Aimee McPherson spoke up, but not often. Relations improved somewhat after World War II, but even today the two groups often find themselves on opposite brinks of the ecumenical canyon, eyeing each other with suspicion. Grant Wacker is associate professor at Duke University Divinity School, and co-editor of Church History journal. This article appeared in a slightly different form in the Journal of Ecclesiastical History in July 1996.